PATIENT HISTORY: This was an incidental finding in an adult patient who died of pulmonary tuberculosis. The two kidneys are joined, as is almost always the case, by their lower poles. The bridge consists in this case of renal tissue. Note that the ureters pass anterior to the bridge and that above this level they are dilated. Note also that the renal pelvices are directed anteriorly rather than medially, a point of diagnostic importance in radiological identification of the condition. Horseshoe kidney is a common congenital anomaly where the kidneys have moved laterally as normal, but remain fused; 90% of horseshoe kidneys are joined at the inferior poles. 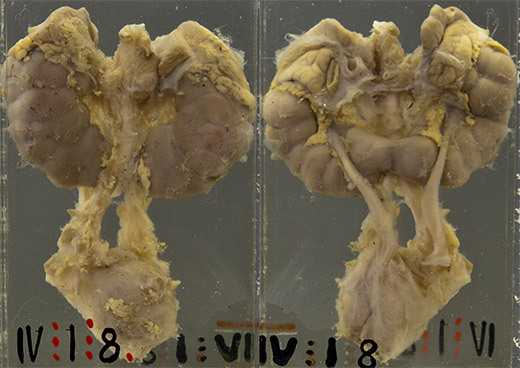 The bridge or isthmus connecting the right and left kidneys can comprise functional renal parenchyma or just fibrous tissue. The isthmus usually lies anterior to the aorta and inferior vena cava, but sometimes behind or between the great vessels. Horseshoe kidney is often associated with other genitourinary anomalies, and also with non-genitourinary anomalies. It is also quite frequently a feature of some chromosomal syndromes such as Turner's syndrome. Infants in whom horseshoe kidney is diagnosed (usually on abdominal ultrasound) should therefore have a complete physical evaluation. Almost a third of patients with horseshoe kidney have no symptoms relating to the anomaly throughout their lives. The remaining two thirds will have symptoms resulting from hydronephrosis, infection or calculus formation. Therefore these patients should be followed up with regular urine analysis (dipstick) and blood urea / creatinine levels. Early in foetal development the kidneys lie close to each other and in front of the sacrum. Usually they migrate upwards and rotate medially almost 90o to reach their final position by 9 weeks. It is thought that abnormal contact between the early developing kidneys may lead to fusion. Subsequent abnormal migration and rotation cause the horseshoe kidney to lie lower than normal in the abdomen, and the renal pelvices to face anteriorly rather than medially, so that the ureters emerge anteriorly. Cases with urological complications may require surgery. 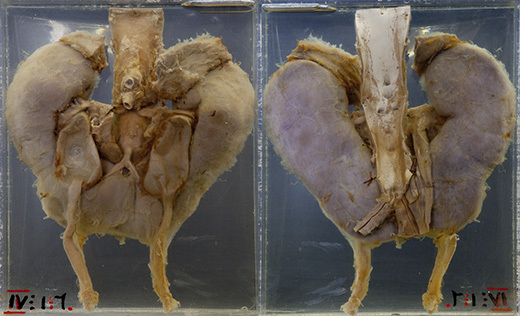 This example of horseshoe kidney was an incidental finding in a newborn who died of an unrelated cause.